I just ordered a v40 and would like some recommendations on cases. I've always preferred 'slim' cases made out of grippy polycarbonate rather than TPU. The Banzn case in gravel green caught my eye on Amazon, but it doesn't have any reviews yet. 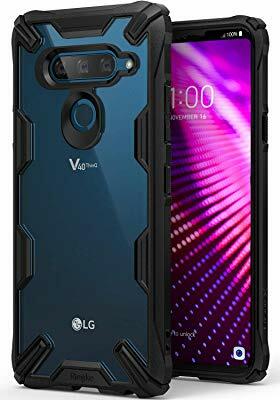 I know this case isn't quite what I just described, but has anyone tried the Spigen Tough Armor case for the v40? I have the tough armor case and for a case that's supposed to be a little beefier than the slim armor and the rugged armor I find it pretty slim. I'm still adjusting to the size difference of this phone vs my old Motorola X Pure though. I'm not sorry I purchased it. LuvMusic and mrvco like this. Can't go wrong with Spigen. Very beautifully designed.. nice matte finish TPU for better grip and contoured edges for comfort.. it's thick enough to protect from drops..
shasticat and TheMarcus like this. I currently have two. A Spigen Liquied Crystal for at work where I'm more likely to drop it and a ORNARTO V40 Case for when I'm at home and "safer. I like both a lot as they both add good grip, the Spigen is much better protection though of course not as slim. Is this a clear case? I used a Spigen clear case once on another phone (I think it was a Liquid Crystal case too) and it yellowed pretty badly within a year. That was the only thing I didn't like about the case. Just curious, by having your credit card(s) so close to your phone, have you ever had "magnetic damage" to your cards? When I was traveling a lot, I had to be careful with my room key because my phone was always erasing them. Started making sure that my phone and room key were on opposite sides of my body and the problem went away. Been using this type of case (in 2 different phones) for over a year and have had no issues. Can't say enough about this case. Definitely my favorite after two previous ones. Very minimal and good grip. Textured and not glossy. I'm using these two and I have nothing but good things to say about them. Snug fit and very thin. I have both of those! Still like them, but I like the feel of this one a little better. OCD when it comes to this stuff. Wife thinks I'm crazy. I just ordered it so I'll check it out when it comes in. I got my v40 last night and the Spigen Tough Armor case. This case is -very- nice, the TPU inner case has a nice solid feel to it rather than the more rubbery feel from other TPU cases. It feels very solid and grippy in my hand. The only thing I would change would be to make the button covers a bit more tactile, especially since i'm not used to the button placement yet. I also ordered one of the Banzn cases and it has a nice grippy feel to it. My only reservation about this case is that the lip around the screen doesn't seem to protect the screen as much as I would like. Thanks! Just ordered it.This case looks so good! Greymire and tube517 like this. I have a spigen liquid crystal which is clear & light. $11.99 from Amazon. Accidentally knocked the phone off the bathroom counter just after getting the case, no problems at all. I usually buy the Ringke Fusion for all of my phones, as they are nice and show off the back. Currently I'm using a Spigen Rugged Armor and really like it as well. With such a large phone, I need a case that is protective but minimal. Ordered my case/glass protector last week and I'm still waiting. Amazon has been slow with a few prime things lately. I noticed a lot of things going out of stock and having delayed delivery dates with stuff pertaining to the V40. I called once on something like you described and was told stock counts were wrong at the nearest facility and they had to ship from out West. Who knows? Case finally came in.......but not before I dropped it and cracked and chipped the screen. Had to put in an Asurion claim before even having it a full week. They sent a new one as opposed to refurbished. Unfortunately the $199 deductible negated my $250 price drop savings.